An example of one of our recently produced residential building markers. 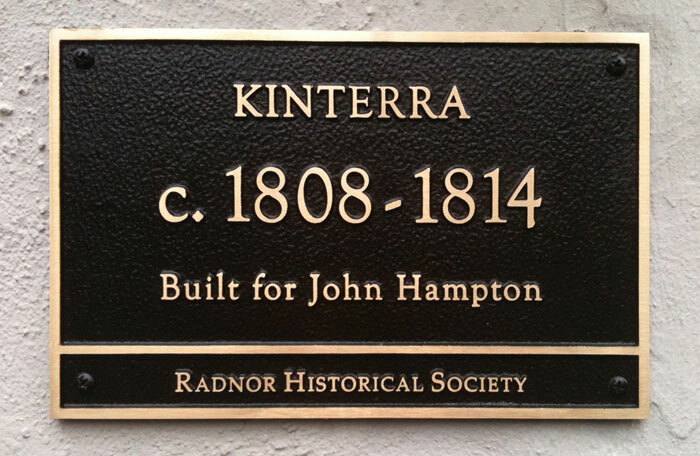 The Radnor Historical Society is thrilled to announce that it is expanding its popular Historic Building Marker Program to commercial buildings. The purpose of the commercial marker program is to make the public aware of Radnor’s magnificent historic buildings, to foster pride of ownership and to help the commercial district attract visitors to the downtown area. These markers will serve to identify buildings of historical and architectural significance and to encourage the continuing care and preservation of individual buildings. There are many buildings in Downtown Wayne that qualify for markers. Before a marker application can be accepted, RHS must determine if enough information is known about the resource to warrant a marker, and if it meets our general guidelines. However, even if no information is in our records, the property owner can submit their own research (with citations) which can include information such as construction date, building name, architect, builder and/or the name of a prominent former tenant. Marker eligibility will be solely based on the building’s exterior, will not restrict paint color, will not require any additional township historical review and is completely unrelated to property taxes. This is a strictly voluntary program and is not related to township ordinances or the Historic & Architectural Review Board (HARB). The markers will be cast bronze and will include the building’s date and when known, historical information such as, but not limited to, its name, original or significant owner/tenant, builder and architect. A typical marker’s dimensions will be 11″x7″, though the dimensions may vary if required by the building’s architecture. Applications should be initiated by the property owner who will bear the cost and maintenance of the marker. We are currently accepting applications for markers. They will be reviewed by a committee established by the RHS that will also do building research for the plaque. Custom fabricated markers with the RHS logo will be distributed to the property owner upon the successful completion of the application, research and paid fee of $200.00 per plaque. Forms and further information are available on our marker page. Email questions to marker@radnorhistory.org. We look forward to hearing from you!